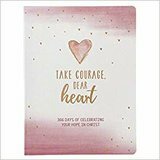 In Take Courage, Dear Heart, Milanie Vosloo's heartfelt devotions will gently remind you of God's eternal peace, unconditional love and all-embracing presence. For the time when you feel a bit soul-shaken and world-weary, Take Courage, Dear Heart will give you the reassurance you need to stay the course. You will be reminded that God loves you and is greater than any challenges or difficulties you may face throughout the year.